Join us in welcoming Olivia Norberg to Northern Virginia Birth Services. We are thrilled to have her on our team! 1. What brought you to be a professional doula? Introduction to birth came very early for me. I was in middle school when I started attending birth workers meetings with my mom. It was so interesting to me. When I was 15, my sister let me be a part of the home birth of her first child. It wasn’t until I had children of my own that I realized being a labor doula was something that I wanted to pursue for my career. 2. What is your favorite part of supporting families? One thing I really enjoy about being a labor doula is encouraging families to have the confidence to advocate for what they want. Sometimes birth can be viewed as just another medical procedure. It is very satisfying to see families take back their voice and work with their doctor as a team instead of being intimidated by them. 3. When did you become a mother? I was almost a month shy of 19 when I gave birth to my son. 4. What are some of your dreams/visions for your profession? I would love to see the mindset of birth changed. Helping women witness that it’s not a passive event but an intimate and spiritual one where they do have the authority to speak up for their body, their baby and their family. I anticipate that as a doula I can help support and empower through education for women to trust their bodies and their instincts. 5. What is your greatest joy in mothering your own children? There is so much joy in motherhood. From the good morning smiles, unexpected hugs, chubby 3 year old arms, to slobbery kisses of a baby. The list can go on and on but for me it is most rewarding when I see the impact that my husband and I have on our children. The little moments when my son, even at 3, stands up for what he thinks is right, is kind to his brother, holds the door open for ladies, or says a heartfelt prayer. Those are the moments I swell up with pure bliss because I can see that the energy and love I pour in to my children is helping to shape them in to men who can change the world, and productive members of society who will make a difference and give back. That is what I live for. 6. What would be your best advice for a new mom? 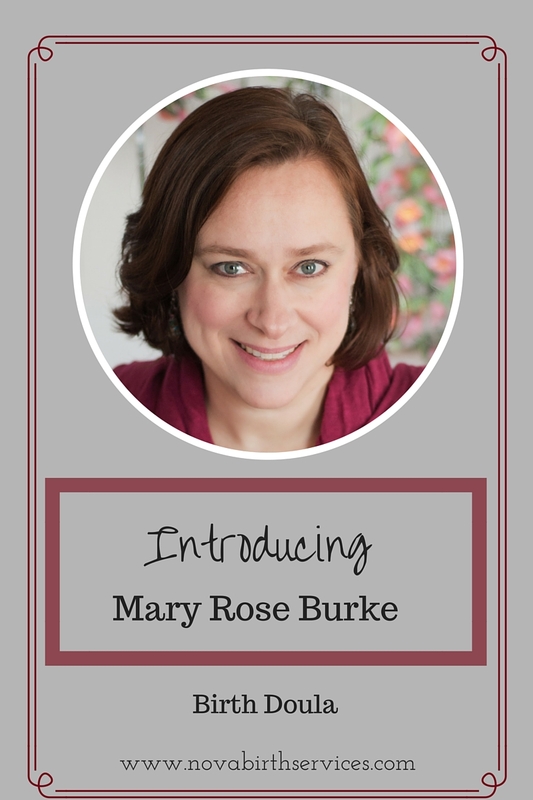 We are thrilled to have Mary Rose Burke as a birth doula here at Northern Virginia Birth Services. Please join us in welcoming her to our team! What brought you to your profession as a doula (labor and/or postpartum)? I first thought about becoming a birth doula when my oldest child was a baby, after the trans-formative experience of giving birth and becoming a mother myself. I read so much about pregnancy and birth during my first pregnancy, and I became fascinated with all of it. Over the last 11+ years, I've had 3 more babies, and now that they're all getting a little older and more independent, I'm so excited to bring this dream to fruition. I completed birth doula trainings with DONA in 2013 and with ProDoula in 2016. I am pursuing certification as a birth doula with ProDoula. What is your favorite part of supporting families? In this day and age, and especially in the DC metro area, the pace of life is so fast, and we are all so busy. I want to provide my clients with a safe space where they can feel unhurried, comfortable, and most of all, heard and understood. I want the families I work with to know that I am there for them, with unwavering support and nurturing care, as they prepare for and transition to life with their new baby. When did you become a mother? In September of 2004, at the age of 29. Where are you from or where were you born? I'm a Northern Virginia native - born and raised! What are some of your dreams and visions for your profession? I am thrilled to be pursuing certification as a birth doula. In the near future I plan to also certify as a childbirth educator, lactation counselor, and placenta specialist. Do you volunteer anywhere and what do you do? I do a lot of volunteering at my church - with the children's and women's ministries, and other general church programs. I also volunteer at my kids' school - in the classroom and at PTA events. What is your greatest joy in mothering? As a Mom, I love those moments of one-on-one connection with each of my children, when time seems to stand still, and we just enjoy each other's presence. I also love seeing the unique personalities of each of my kids develop and grow over time - they are each so different, and I'm so thankful I get to be their Mom! What is the hardest thing about motherhood for you now? Things can get a little (okay, a lot!) wild and crazy in our house, with four active kids, and a frisky Beagle thrown into the mix as well. My kids generally get along, and I know they love each other immensely, but when there are sibling squabbles, I have a hard time not feeling overwhelmed and stressed out - I don't enjoy conflict! But I'm working on staying calm in those heated moments. What would be your best advice for a new mom? It's okay not to have all the answers. None of us have all the answers. Just know in your heart that you were specifically chosen to be this baby's Mom. Your baby doesn't need you to be perfect; we all make mistakes. As long as you are always learning and growing, that's what matters. Trust your instincts, never be ashamed to ask for help, and give yourself a lot of grace - every day is a new day and a fresh start. I think these are good reminders for all Moms - I still have to remind myself of them pretty often!